Dr. Jim Kuthy presenting about the "Essentials of Test Validation"
Biddle consultants Jim Kuthy, Ph.D. and Heather Patchell, M.A. 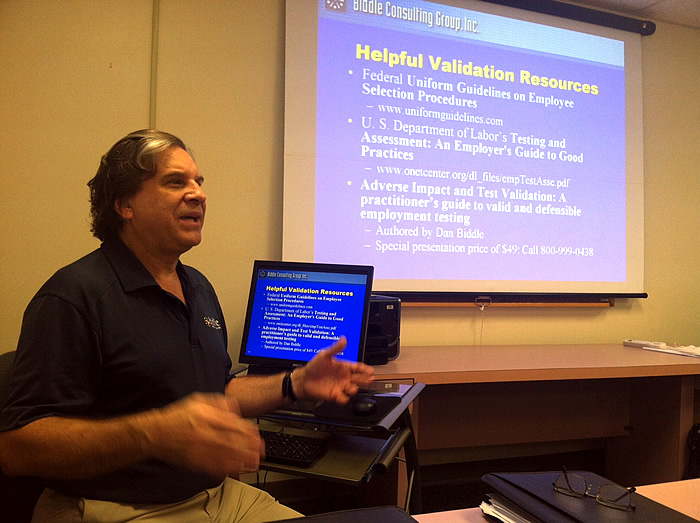 are in Mobile, Alabama this week providing training for the Personnel Board. WorkSTEPS , the nation’s leading provider of functional employment testing, recently announced a partnership with Biddle Consulting Group, Inc. to release the new Physical Ability Testing Job Analysis (PATJA) tool, which is designed to develop validated Physical Ability Tests for a variety of jobs. The exclusive WorkSTEPS/Biddle partnership provides unprecedented legal defensibility of the WorkSTEPS functional employment test, already recognized as the industry’s gold-standard. The PATJA tool, for the first time, automates the creation of testing criteria to yield objective and defensible functional employment tests.